I just got back from spending the weekend at my mom’s. As part of my mother’s continuing saga of cleaning out the attic, she found her collection of records which includes some amazing children’s records. Now that there is the pitterpatter of grandchildren’s feet around the house, they’ve been getting a second playing on the record player in the upstairs bedroom. Everyone loves them and listening to them this weekend was a trip down memory lane for me. 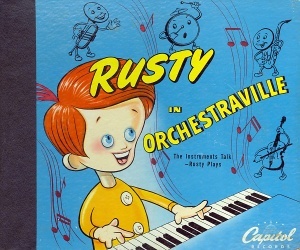 One of our favorites was "Rusty In Orchestraville"
and hoping to take this classic story home to share with my girls, too, I looked for it online in CD form. My searches led me to an amazing find. 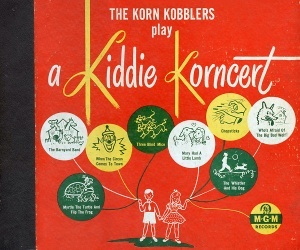 A project called kiddie records weekly. 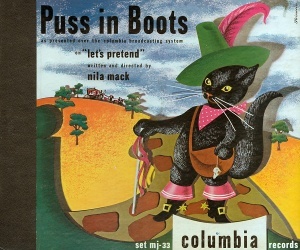 The project celebrates "the golden age of children’s records" from the mid-forties to early fifties. And in an effort to avoid their extinction and have them enjoyed once again by online listeners, they have brought them back in the form of downloadable mp3s. 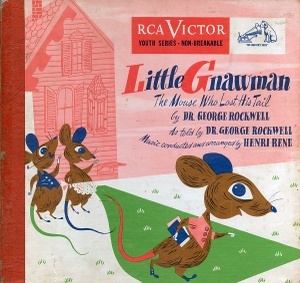 Each week in 2005, and continuing in 2006 they offer a new children’s record for download. You can download and burn the complete record as well as download all cover and dust jacket images. It really is an amazing gift. I’ve already been downloading like crazy and the girls enjoyed Rusty in Orchestraville and some Uncle Remus on the ride home. My mother made the comment that these stories are enveloped in rich, beautiful classical music. And the endearing storytelling is unmatched in our day. I know so many of you will love these. Oh yeah — we are psyched. Thanks so much for the info. Andy has now got a major project to do for me! oh my goodness, i can’t breathe! i’m listening to the lone ranger on kiddie records weekly – what an AMAZING site! i’m going to download and download…. my kids LOVE stories on CD and stuff, they’ll love these goodies – thanks for the link! thanks for sharing this terrific find. i loved listening to records as a kid as well and I know my 3 will too. How funny! Just this weekend I bought some children’s 45’s at a garage sale for my kids to play like I did when I was little. Does anyone remember the Thumbelina record with that scary toad that wants to marry her? Thanks for the awesome link!! what a wonderful find! The album art is so fun to look at! And Bessilu, I *do* remember that Thumbelina record – the toad was so creepy!!!! WOW! what a find! tthanks so much – i will be burning many for our long drive up to canada next week… to play along with the fantastic cds you sent us of course!! here is a link to a zippered pouch tute I used http://www.craftster.org/forum/index.php?topic=82669.0 but everybody does it differently. From experience, painful, it is very important that the zip is just right in lenght. oh found you via Cheeky Beaks. oh molly. thank you so much for these links. i cant wait to go down load all of this. i instantly recalled all the time i spent listening to eustace the useless rabbit. Aaaghh… too much to do, but now I MUST download a few…. Thank you- what a great find! oh my goodness — i’ve been itching to get rusty in orchestraville! what a great site — thank you! thanks for the link info. i’ve always loved “little black sambo.” we would get it from the library as children, until it was banned. i have several copies of the book (brand new, old, very very old, even a viewmaster slide) but i don’t think i have an audio version! oh god-the record covers!! amazing! i can’t wait to hear these!